Winter, is the best time choose your hop twiddling stick. The trees are still bare making it easier spot a good one and the sap has not yet risen. 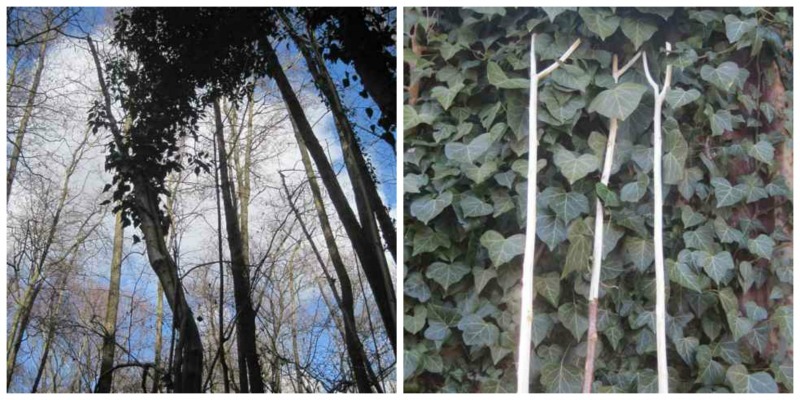 The Hazel is one of our native trees found growing in classic coppiced woodlands, it is a very useful tree. Its wood is used in many diverse ways from water divining sticks, traditional sheep hurdles, to the thick straight rods which have been used for generations of gardeners as runner bean sticks. Hazel provides all manner of riches but it is the tall straight rods of medium thickness which I am looking for, I can select my new hop twiddling stick from amongst these. These straight rods are called summer or sun shoots. For the best hop twiddling stick ideally you need a straight rod with the right shaped fork, not too tight and not too wide, this fork will need to trap a hop bine head without pinching it thereby snapping the head off. The rod has to be the right thickness, too thin and it will not be up to the job and too thick it will be cumbersome and make your arms ache lifting it up to manoeuvre it above your head all day. So as Goldilocks said it has to be ‘just right’. So first find your perfect hop twiddling stick, then cut it out, trim both ends and debark it if you prefer. It does need to run smoothly in your hands so no untrimmed notches should be left. When I have cut a few I tie them to a length of wood to allow them to dry out and remain nice and straight. I actually like a fork with a kink one side like the one shown, I find this slight bend runs nicely up the strings. 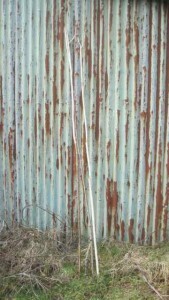 Hop twiddling sticks are needed for ‘Heading’ which is the third and final stage of hop training every year. 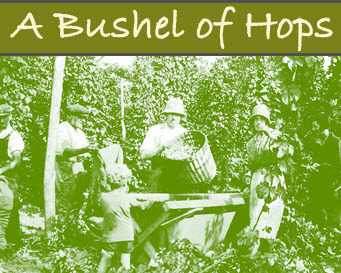 Each hop plant is trained by hand at least twice during their growing season but usually 3 times. By mid May the rapidly growing bines of most varieties are far out of reach for easy hand work. In order to put any heads back onto the strings it is then that we need our hop twiddling sticks. 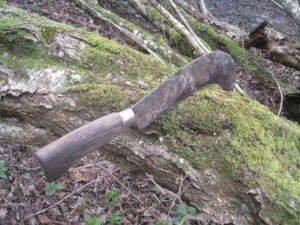 Like any personal hand tool you just get used to your own hop twiddling stick, It is just easier to use your own, but it is not something you can share easily either. You would always be waiting for the other person to finish using it. Whilst most people would not dream of sharing their special stick, if you are lucky they might offer to do your hop instead! 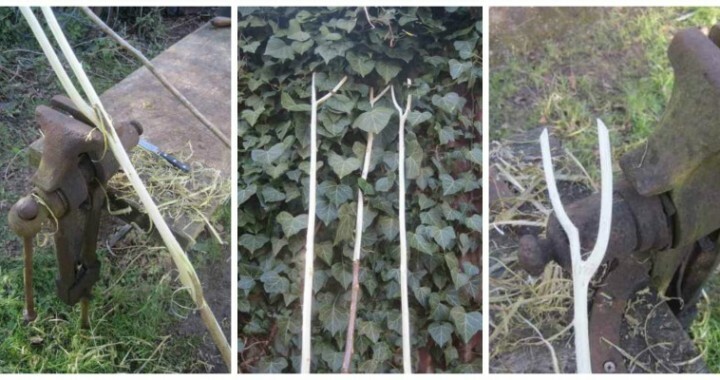 Another use for your hop twiddling stick is to mark your hop plant with it, it is now surprisingly easy to stray off course and loose exactly where you were in the hop garden. You can leave it in the plant you have got to at the end of the day or simply mark your hop when you go for lunch, as I said earlier it is very easy to loose your place once the hops are full size. If you find a stick you like, look after it and keep it oiled between seasons. They can be found tied onto the beams in barns etc. Someone moving into a cottage in this area found a twiddling stick which had been carefully tied above the stair well by its previous owner. I have an assortment of three hop twiddling sticks. 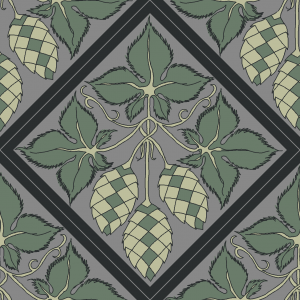 A short one, only 3 foot long for bines only just out of reach slightly above head height and then a longer one for the main heading work when the hops are much higher, this is about 8 foot long. The wirework can be up to 18 foot high. Again as with most jobs, there is a knack to heading hops but it is easy once you have got it, rather like learning to ride a bike. If you are right handed you hold the stick in your right hand. You don’t try to put the heads back onto the strings which seems logical, but rather twist the string and allow the hop to stay still. To do this you hold the string in your left hand and twist the string around towards you in a clockwise direction, then catch the head of the bine into the fork of the stick, place the ‘v’ of the stick with the head held in it against the string and untwist the string anti-clockwise. That way the head will normally seat itself back easily following its clockwise natural twist. If you get an awkward hop you sometimes feel like your head will fall off instead!! Sun glasses are essential kit, not only to protect your eyes from the sun but they stop any small bits of plant debris from falling into your eyes as you move the plants. Sometimes after summer storms and the hop bines have been off their strings for a while they can become long and heavy, then it is not so easy. 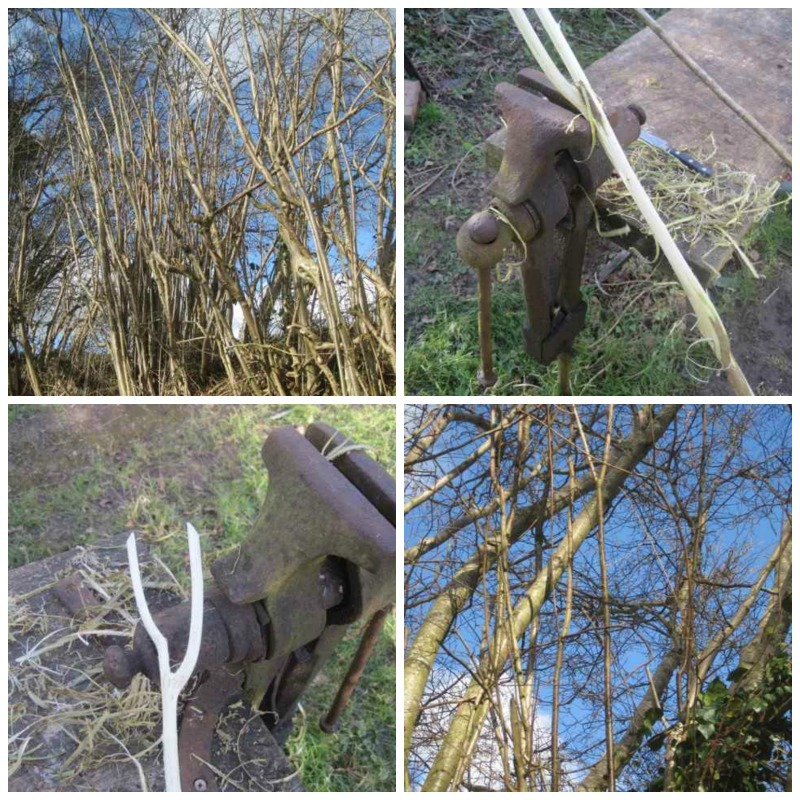 I then find using two sticks which while it may look awkward, is the easiest way of dealing with the problem without damaging the bine or breaking the head off. So holding the offending hop with one hop twiddling stick and putting the head back on with the other prevents this damage and is much easier than it looks. I have to admit it does looks downright plain awkward, so best solution don’t watch anyone else doing it. The pictures below show the same stick before and after cutting, it is the one on the left of the group. Once the hops are safely up and over the top wires, we all breathe a sigh of relief, that will be the last of heads coming off for this year. Traditionally bines should be over the top wires by Midsummer’s day but some varieties can be over the top long before then.